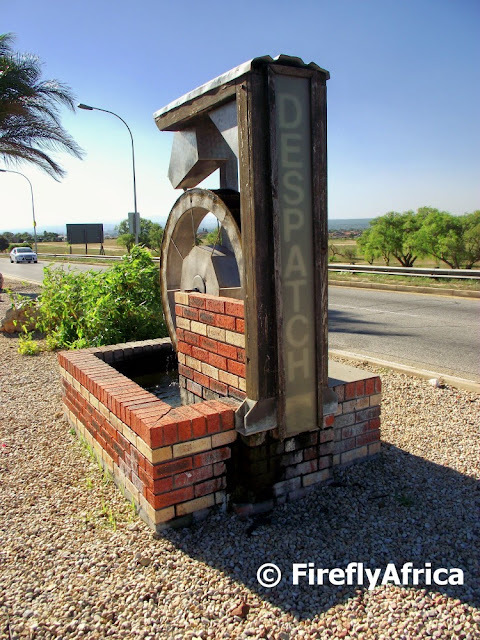 Originally developed in 1942, Despatch is regarded as a relatively young town and only officially obtained municipal status in 1945. The name of the town was derived from the brick industry, as it was from a railway siding (later known as “Hitler’s Halt”) in the late 1800’s near Uitenhage, that bricks were “dispatched” or rather, “despatched’. Many of the older buildings and houses in Port Elizabeth and Uitenhage were built with these very bricks. Sadly, the brick business is now a remnant of the past. 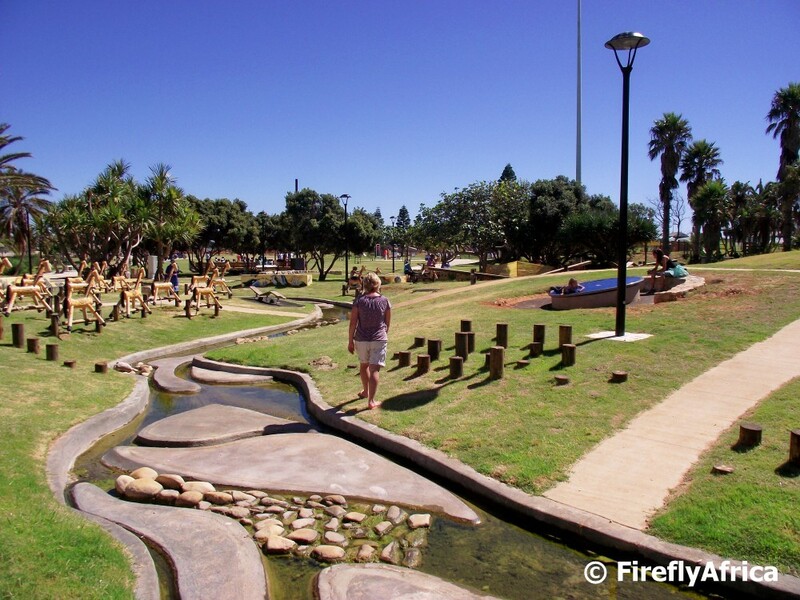 Offering the charm of a rural town in the heart of a city Metro, Despatch currently has a resident population of about 30 000. I often wish I lived in Schoenmakerskop. A beautiful place for walks, swims, snorkeling, fishing (not that I'm a fisherman), sunsets and photographs. Plus its nice and peaceful in the week and only gets a little busier over weekend. My kind of place, unless the wind pumps out of the south-west. The Cape Recife Lighthouse looking spickerish with its new coat of paint. The 24 metres high octagonal masonry tower was built in 1851 to warn mariners of this treacherous piece of coastline west of Port Elizabeth. 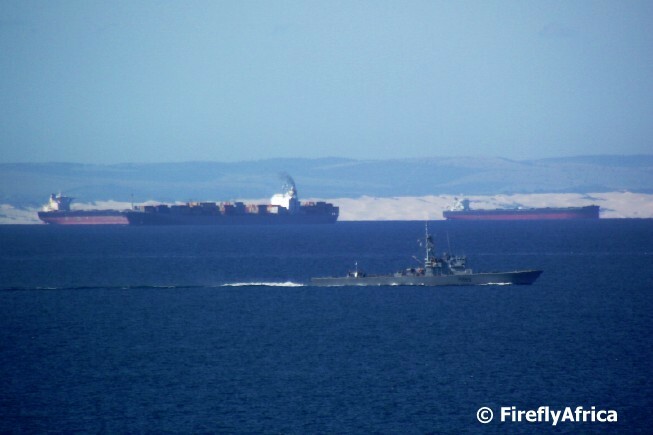 The light can bee seen from 29 miles away making sure that ships steer clear of the dangerous Thunderbolt Reef. 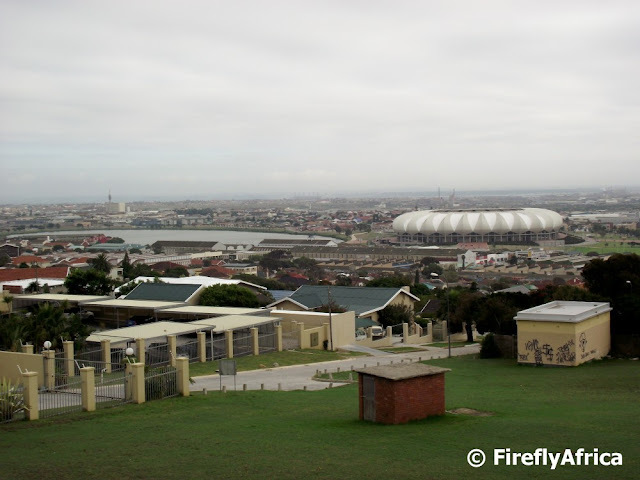 With the completion of the Nelson Mandela Bay Stadium in 2009 it immediately became one of Port Elizabeth's most recognisable landmarks. This is the view of the stadium and North End Lake from the Mount Croix area. Kings Beach is a beautiful piece of white sandy beach stretching from the harbour wall up to McArthur Pool. 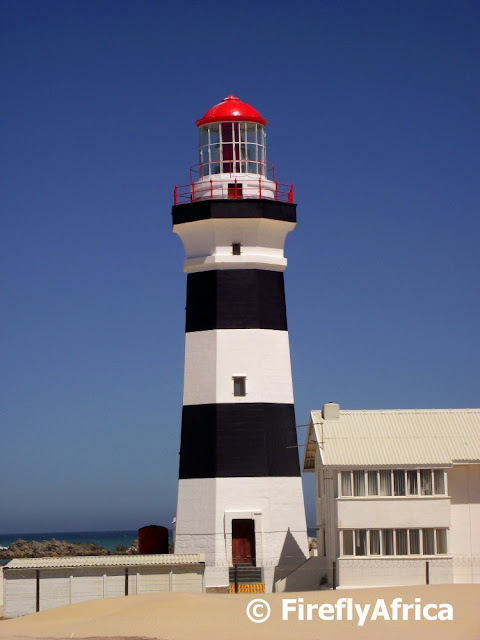 With the royal visit to South Africa in 1947 the royal family also stopped in Port Elizabeth. The train they were travelling on was parked just above what is now the Kings Beach parking area and apparently part of the beach was fenced of for the use of the royal family. The princesses went horse riding and the king went for swims in the sea. 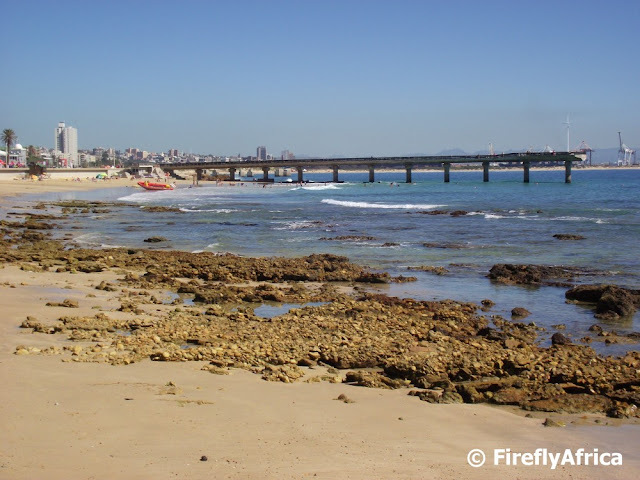 This meant that the locals started calling it the King's beach and hence the name Kings Beach. The picture was taken from the harbour wall looking back towards Humewood. Most people notice Route 67's big colourful mosaic next to the Donkin Reserve but doesn't realise that there is another beautiful mosaic right across the green in front of the King Edward Hotel. The Welcome Carpet was done by Lisbet Demeyer and was one of the first art pieces to be done as part of the Route 67 development. 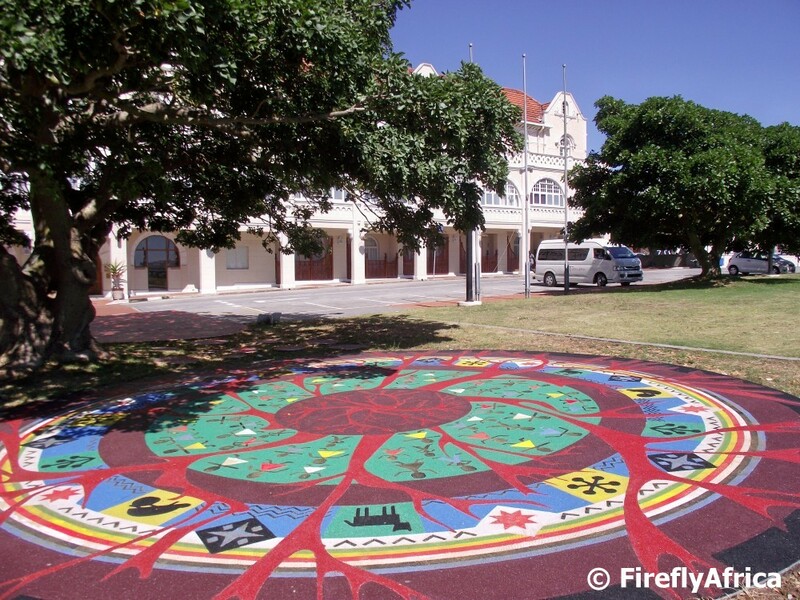 The mosaic is made up of coloured quartz and bead work and forms a red carpet welcoming visitors to the Donkin Reserve. 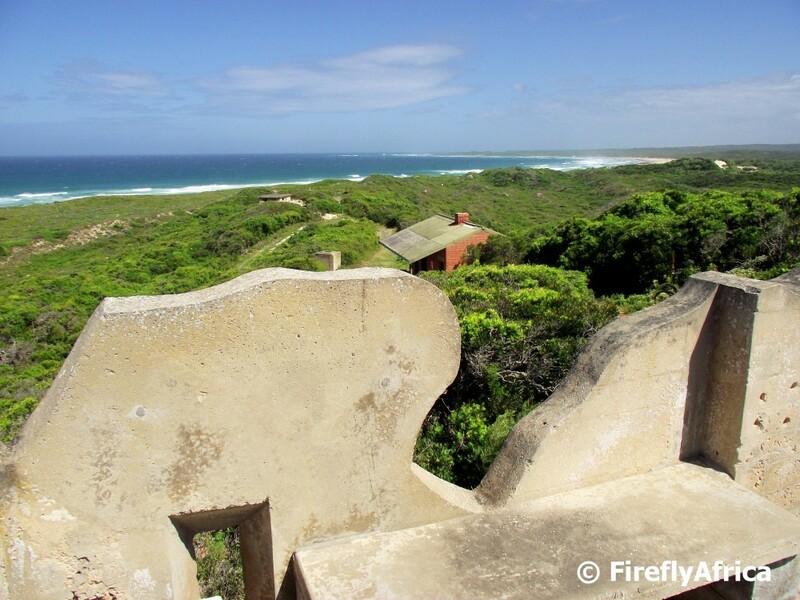 The design hints at the cultural context of the Eastern Cape. 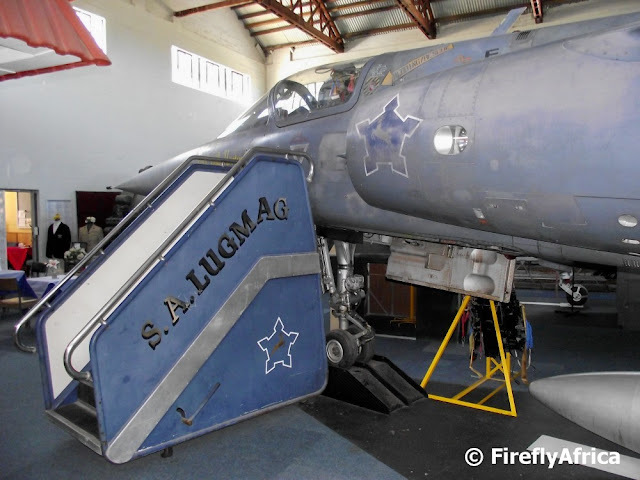 The South African Airforce Museum in Port Elizabeth has a fantastic collection of aircraft, miniatures, uniforms and other memorabilia for such a fairly small museum. They receive very little funding from the airforce itself and get a lot of their funds from donations while a lot of the work done there are done by volunteers. One of the aircraft in the collection is a SA Airforce Dassault-Breguet Mirage F-1CZ which was manufactured in France and first took to the air in 1966. 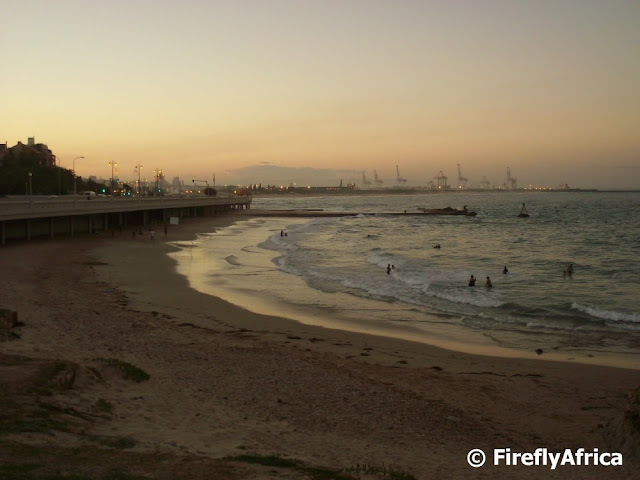 One of the things I've discovered since I've taken up geocaching is that even though I thought I knew everything there is to see in and around Port Elizabeth, I haven't. I've already been to at least three spots I've never visited before and I have another two new places lined up. One of those I haven't seen before was a corner of Settlers Park called Wellington Park which is quite popular for a short walk with the residents living in the area. Along the trail I found a little monument which was erected in the mid 1900's to remember the landing of Jan van Riebeeck in the Cape in 1652 and the British Settlers in Port Elizabeth in 1820. If it wasn't for geocaching I would never have known that this is there. 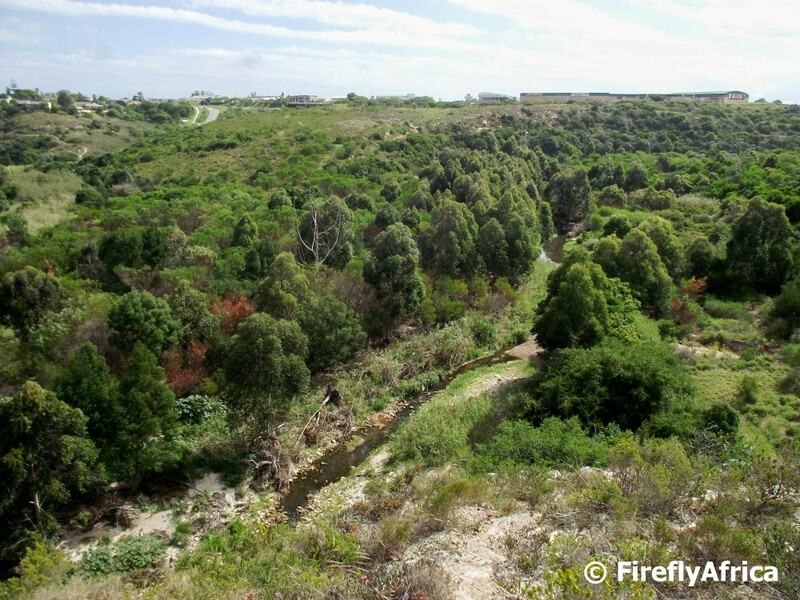 I don't think all Port Elizabethans realise how fortunate we are to have the Baakens River flow through the city, creating a green belt all the way from the suburbs towards the city centre and the Port Elizabeth Harbour. 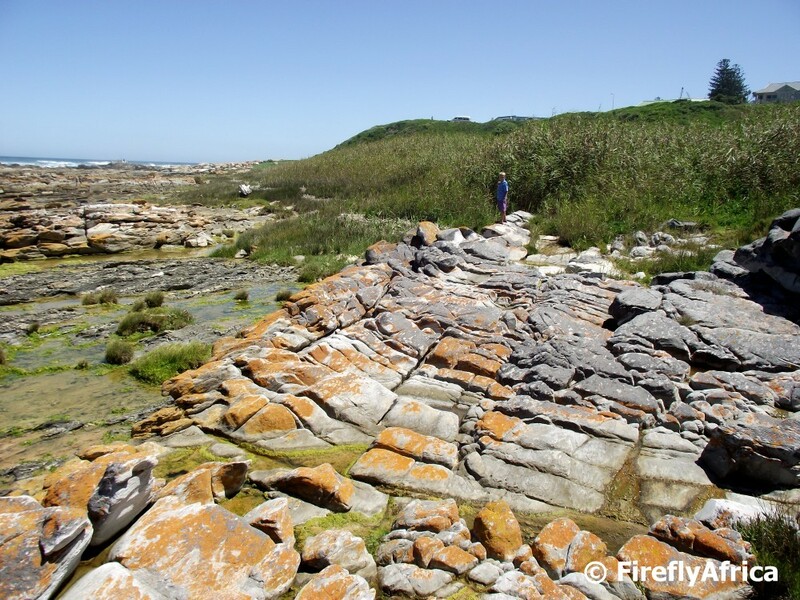 The Baakens Valley is great for walks (or hikes), mountain biking, trail running, bird watching and so many other activities. On the day I took the photo I was out geocaching with Chaos Boy, looking for one of quite a few caches placed within the Baakens Valley. The photo looks across the valley from Newton Park towards the Moffat Retail Centre and the William Moffat Expressway. 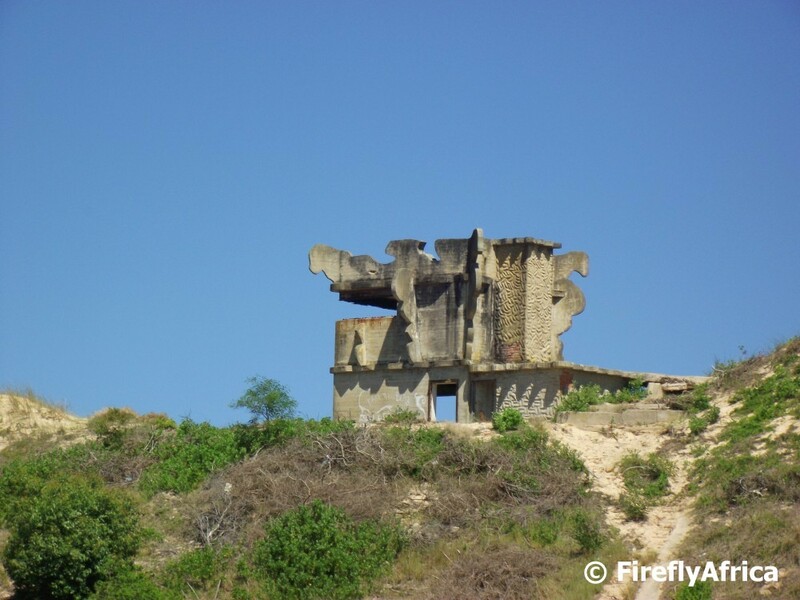 I have posted in the past about the series of Fortress Observation Posts that was built around Port Elizabeth at the start of the Second World War as harbour defences, showing in particular the one in Cape Recife. 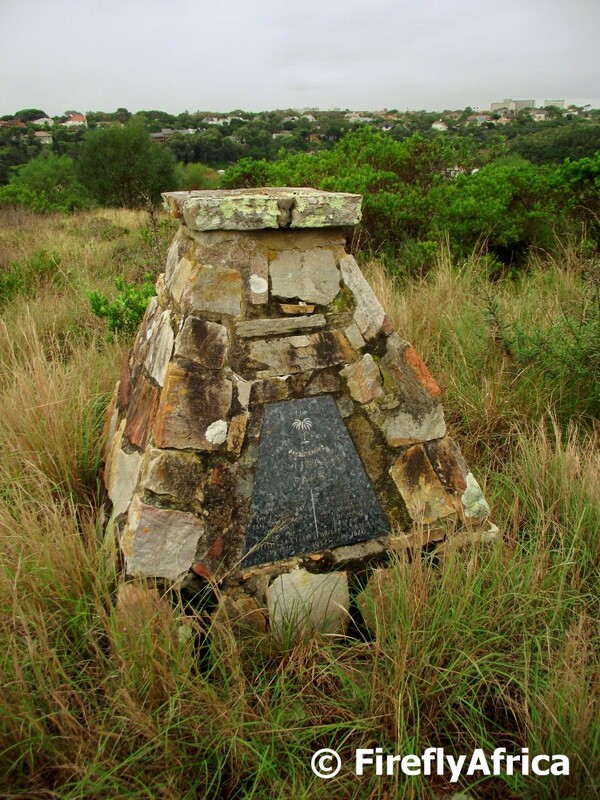 The FOP most people may have seen before is the one sitting on the hill above Schoenmakerskop. Notice the curves along the edges which was part of the design to make it blend in against the bush and hills behind it. This was done so that it wasn't easily visible from the sea. And before somebody asks where the bush and hills are, this picture was taken from the side. 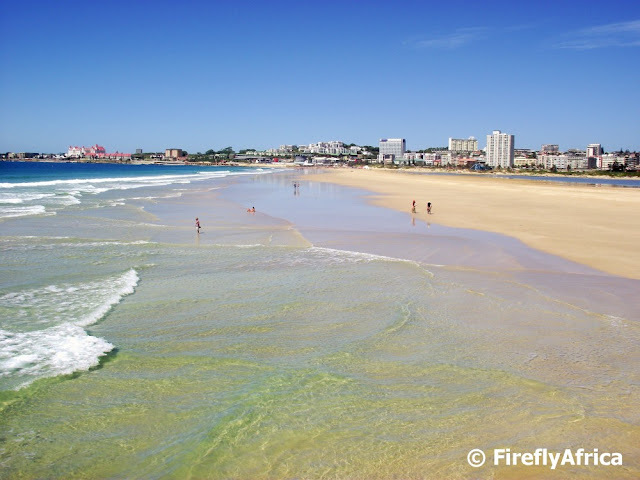 Today was a marvellous day in the Bay just proofing once again that this is the best time of the year where weather in Port Elizabeth is concerned. I went for a walk around the new Kings Beach development with the Damselfly and just realised again how the beachfront has been enhanced. And its not even finished yet. I can't wait to see the new additions they're still working on. Plus what is yet to come. 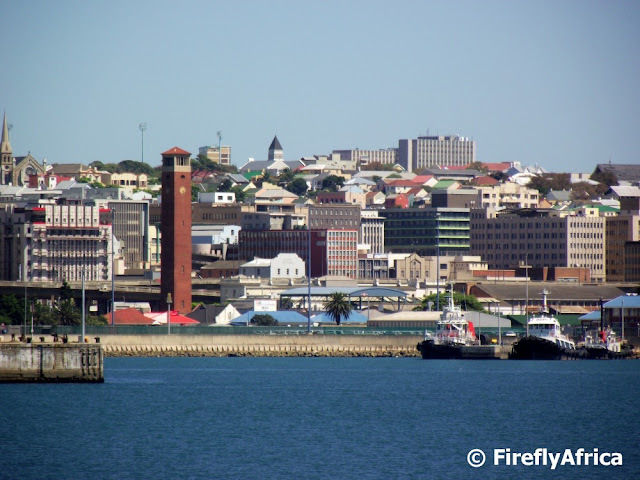 Looking across the Port Elizabeth Harbour from the harbour wall to the city centre with the Campanile just to the left of the middle of the picture. This is a view of the Campanile that not a lot of people have seen. The Hill Presbyterian Church can just be seen on the left edge of the photo. 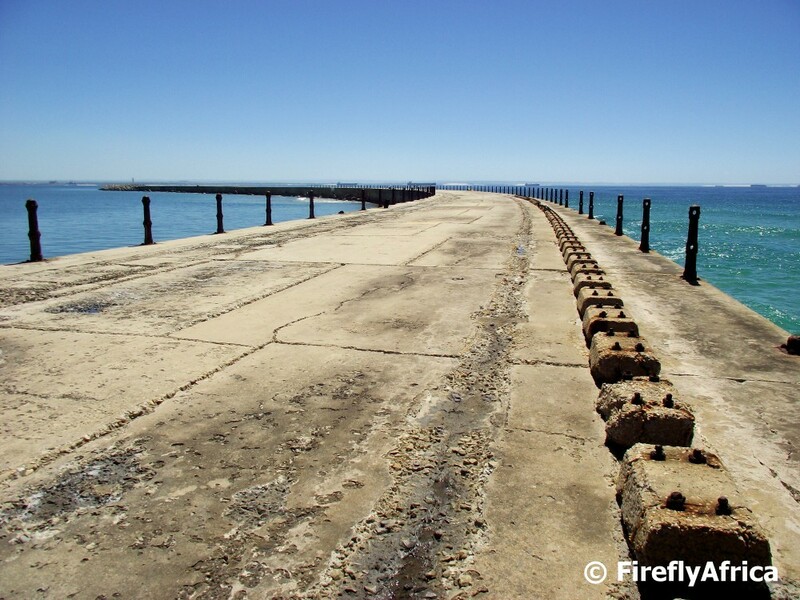 Many years ago people could fish off and walk on the Port Elizabeth Harbour wall, but this changed with the upgrading of security protocol at harbours a numer of years ago. Big Huge Humongous was my surprise when I went for a walk on Kings Beach all the way to the harbour wall for the first time in a very very long time. Getting to the wall I found no barriers, no fences or even signs stating that one isn't allowed onto the wall. A guy with two dogs walking in front of me walked all the way to the end of the wall and back while I turned around at the point where I took the photo. My favourite Route 67 art piece on the Donkin Reserve must be The Voting Line. The Voting Line was created by artists Anthony Harris and Konrad Geel and consist of life-size laser-cut steel figures that form a symbolic voting line celebrating the voters as they were seen in the country's first democratic elections in 1994. 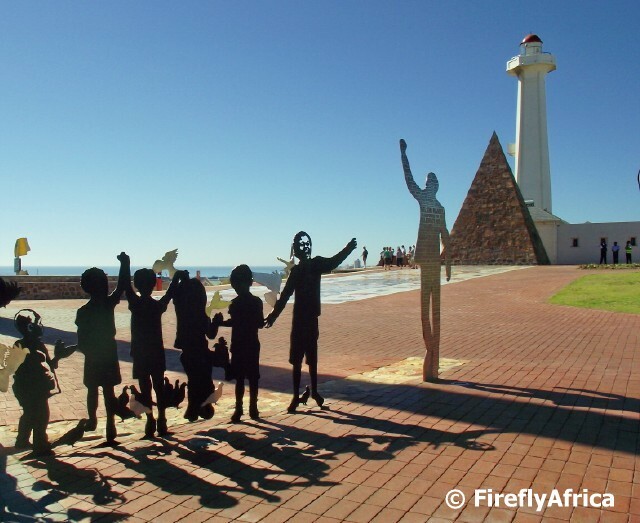 At the front of the line stands the figure of Nelson Mandela, fist triumphantly in the air, and a group of children. The children representing both the future of our country and Madiba's deep care and devotion to childern. Along the Wildside there are many fresh water springs that originate from water that has collected between the (vegetated) sand dunes along what used to be the Driftsands area. The water then emerges again on the coast in the form of springs and flow to the sea. In some places it dams up above the high water mark between rocks and swampy spots get formed. In the search of a geocache the other day I had to cross through one of these close to Schoenmakerskop and boy did I have to walk carefully to avoid getting my shoes wet. You won't encounter any crocs or even the Swamp Thing in these any time soon though. Its officially autumn (or has been for the last 11 days), but may the summer weather remain for quite a bit longer. Here's hoping, I'm not quite ready for winter yet. 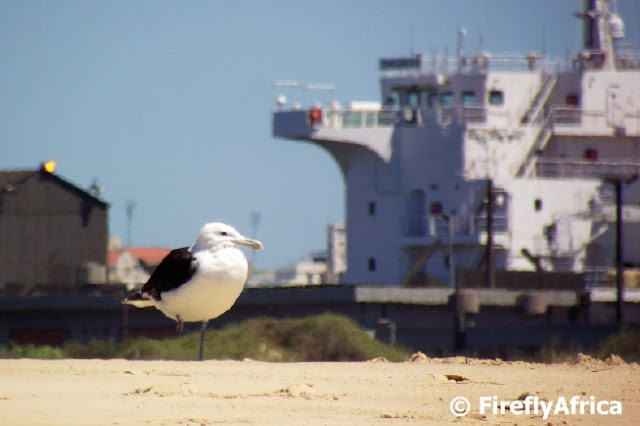 A kelp gull taking it easy and enjoying the view on Kings Beach with a ship berthed in the Port Elizabeth Harbour in the background. A navy ship busy leaving Algoa Bay while a number of big ships wait in the background to enter either the Port Elizabeth or Coega Harbours. 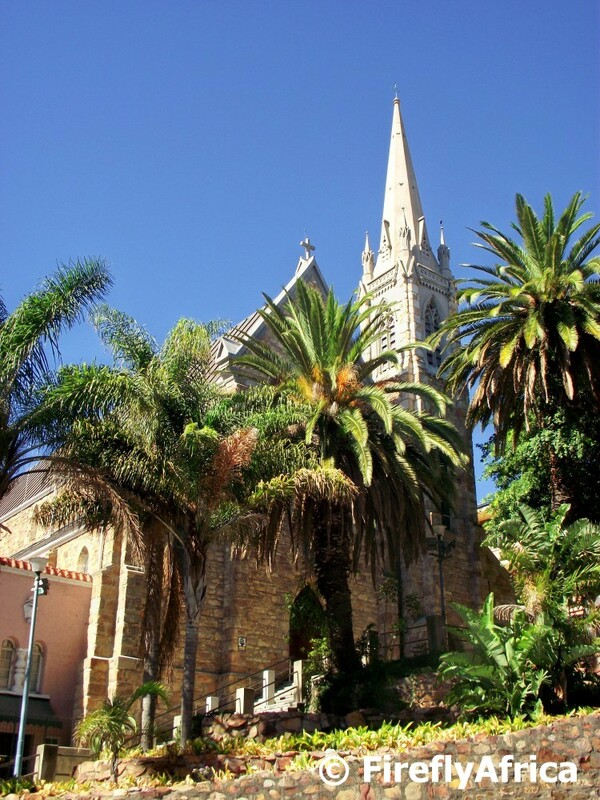 Port Elizabeth has two beautiful cathedrals literally a couple of hundred meters away from each other in the city centre. The one is the St Mary's Anglican Cathedral while the second (in picture) is St Augustine's Catholic Cathedral. 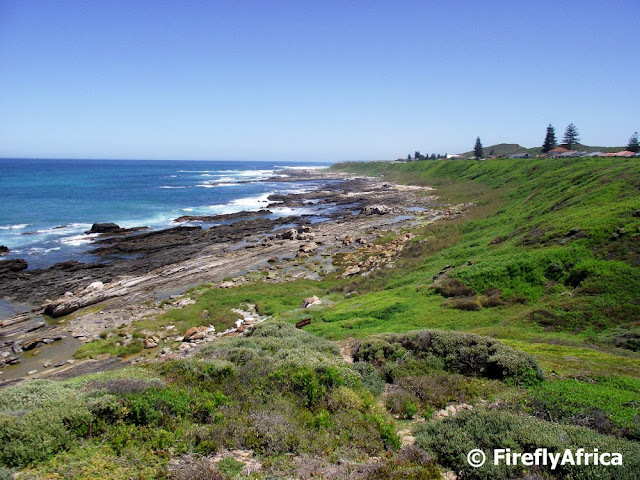 When the first Catholic priest set foot in Port Elizabeth in 1840 (after being shipwrecked in Cape St Francis and having to travel the last 100km to town on horseback), there were only 42 Catholics in the town. In the coming years the Catholic community grew and flourished and in 1861 construction started on St Augustine's on land purchased on Castle Hill. The project took place under the watchful eye of Father Thomas Murphy. St.Augustine’s was opened and solemnly consecrated by Bishop Moran on the 25th of April 1866. The bronze statue of Christ the King which can be seen above the door was donated by the Frost family in 1931. Click here to read the whole history of St Augustine's. Talk about a structure standing out like a sore thumb. In this case looks more than one of the other fingers though. 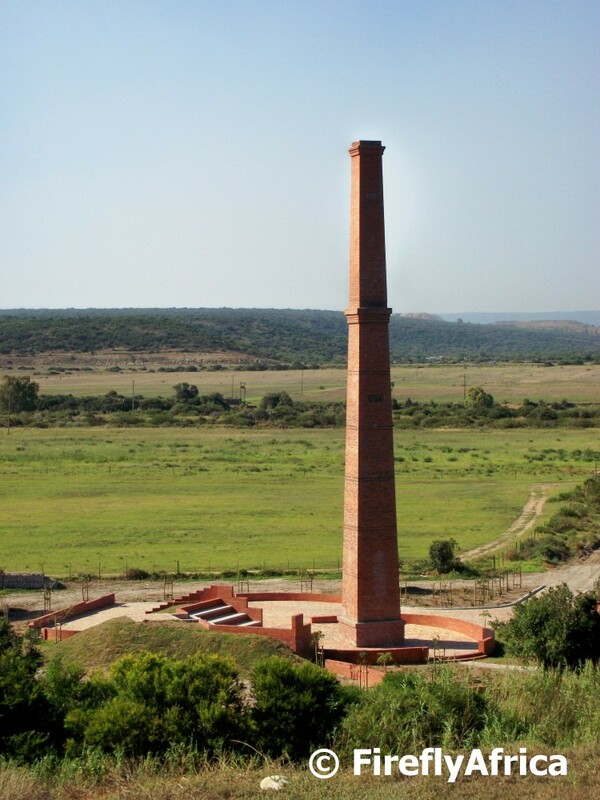 The Despatch brick works chimney was built in 1882 and was once part of a flourishing brick works. 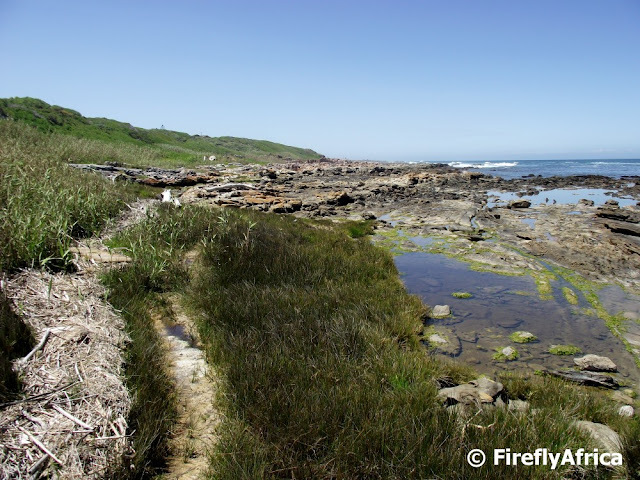 Bricks were "dispatched" or rather "despatched" from here along a railway siding (later known as "Hitler's Halt") to Uitenhage and Port Elizabeth. Many of the older buildings in PE and Uitenhage were built with these bricks. Guess where the town's name comes from. St Georges Park has a stunning outdoor theatre venue called Mannville which (used to) host the annual Port Elizabeth Shakespearean Festival. Unfortunately due to people who feel that they are entitled to other folks' property and those who purposefully go out and damage what is not theirs, the festival has been moved to indoor theatres the last two years. The theatre was established in 1972 by Bruce and Helen Mann and if only these bad elements can be kept out of the park, the theatre could host so many different plays and events. On Saturday while having a walk along Kings Beach we found that there was a regional Nippers competition on the go. Nippers are young Surf Lifesavers between 5 and 14 years old. 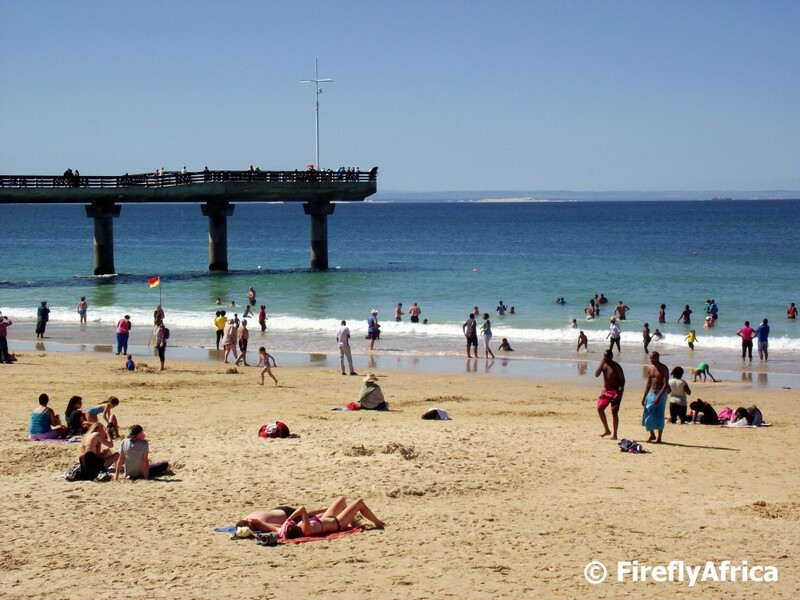 Unlike senior Surf Lifesavers, the majority of them do not patrol the beaches but focus on fun and surf awareness. Nippers learn about safety at the beach. They learn about dangers such as rocks and animals as well as surf conditions such as rip currents, sandbars, and waves. 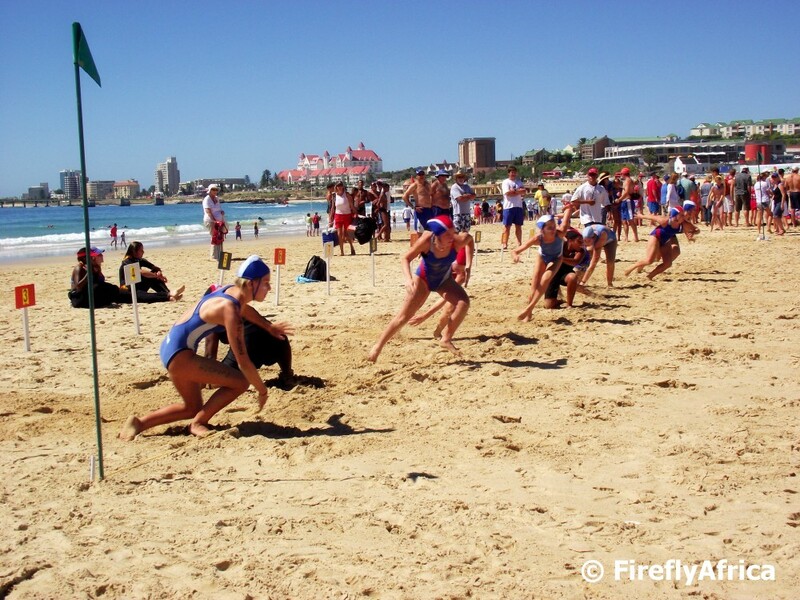 Like their Senior counterparts, Nippers participate in a variety of individual and team events like beach sprints, Flags, swimming and board races. After watching the kids we are strongly considering letting Drama Princess try it out next summer. A couple of months ago I won a two nights Protea Hotel voucher in a competition and the expiry date started to approach so we decided to not go out of town for it but rather enjoy a weekend "holidaying" in our own home town. The KidZ stayed at their grandparents and the Damselfly and I just planned a weekend of relaxing and walking on the beachfront. Believe it or not, it actually felt like we were somewhere else. We didn't have the KidZ being hungry or thirsty or tired all the time and didn't have to rush because we had to get home. We could have an afternoon nap or just sit and enjoy the view. Walked all the way to the harbour wall and spent an hour watching a Nippers competition on Kings Beach. And the weather played along beautifully. It was pure bliss. The cherry on top? 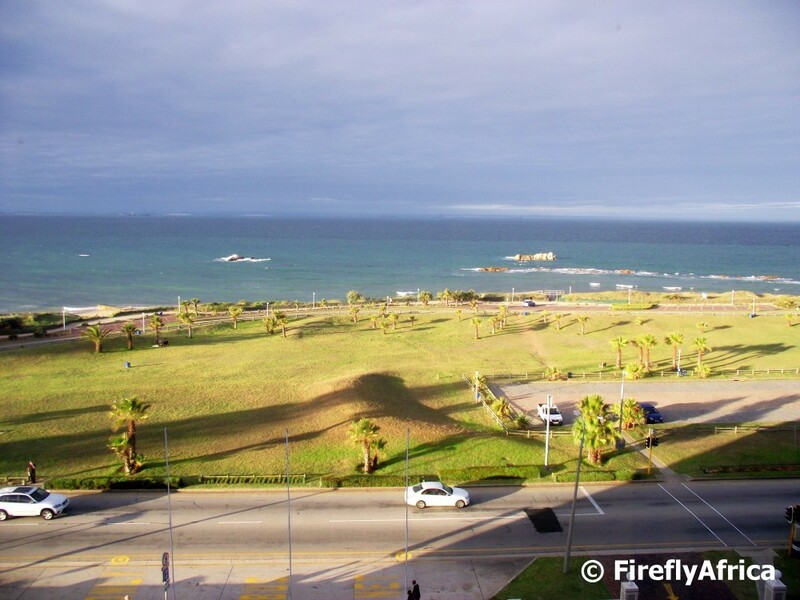 A sea view room on the sixth floor. Nice! 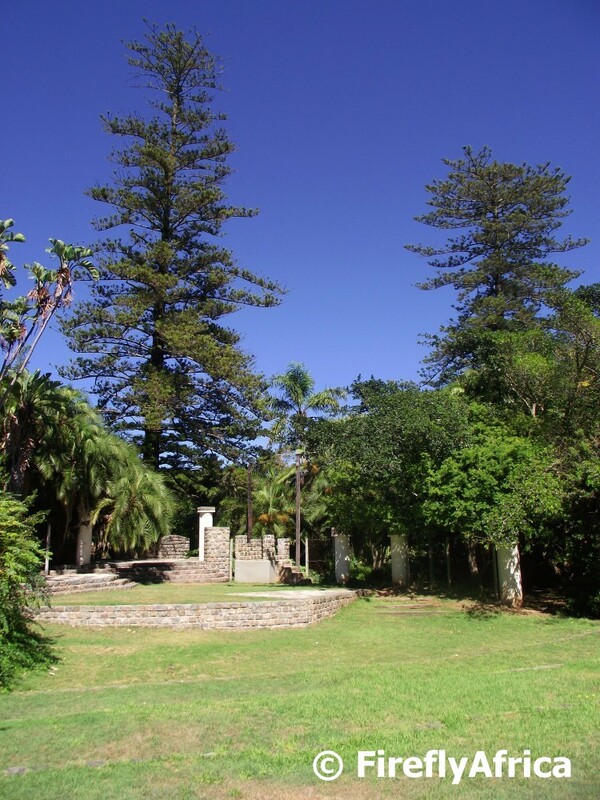 Across the road from the South End Museum stands an old Wild Fig tree which is thought to be over 100 years old. The tree stands next to what used to be Chase Street in the old South End and back in the days the kids used to climb the tree while the older people sat in it's shade. When the people were removed and the buildings in the area demolished, the fear was that the tree would also be chopped down or pushed over by a bulldozer. Luckily this didn't happen. 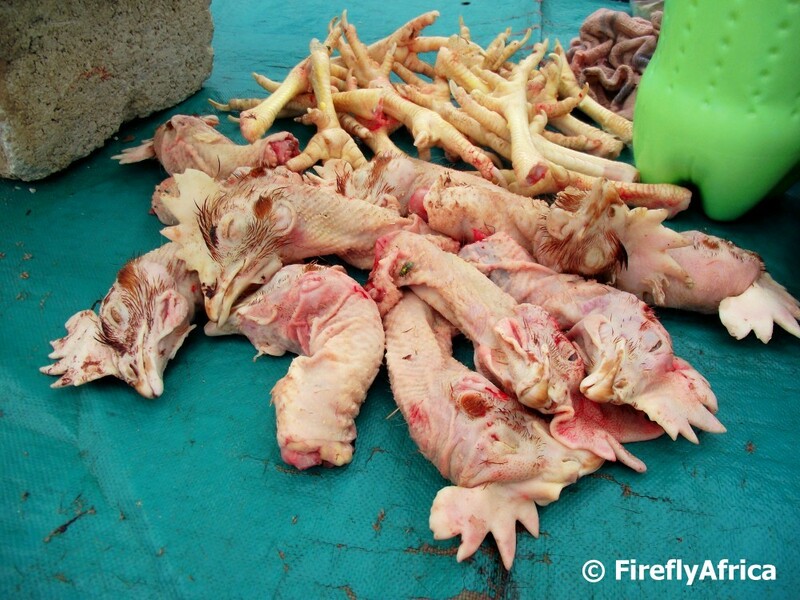 Chicken heads and feet, better known as Walkie Talkies, at a township marketplace in Njoli Square. 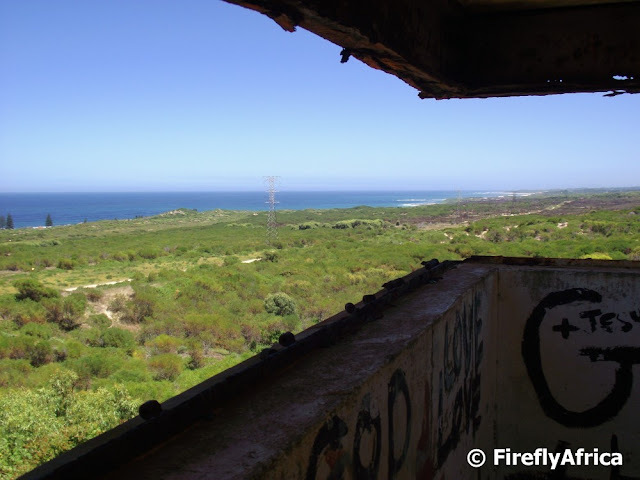 The view from the top of the Fortress Observation Post (FOP) in Cape Recife looking west. 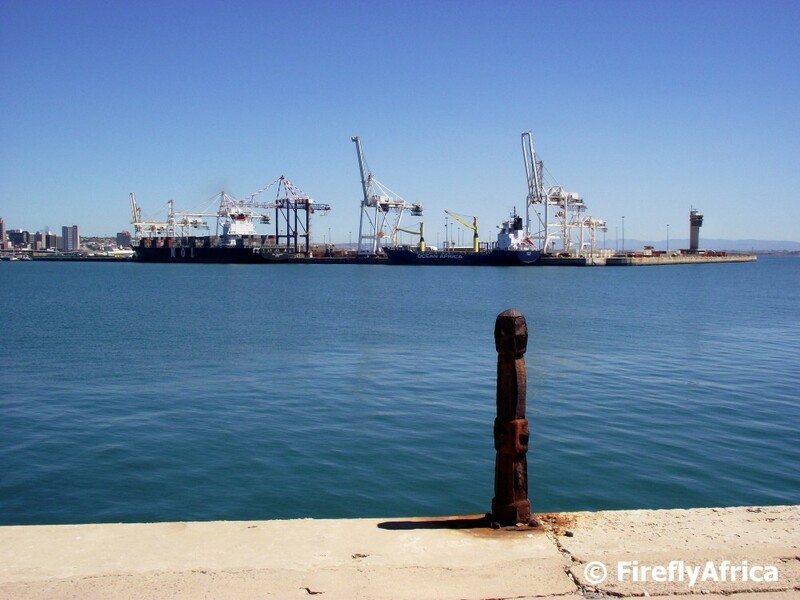 The Cape Recife FOP was one of three built at the start of the Second World War as part of the Port Elizabeth harbour defences and acted as lookouts for enemy boats, subs and planes.